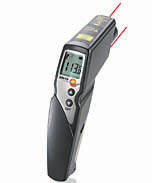 The fast and versatile infrared thermometer with 2-point laser marking and 30:1 optics. The surface temperature, also of smaller objects, can be measured at a safe distance. The diameter of the measurement spot is only 36 mm at a distance of 1 m.
Possibility of connecting external temperature probes.